GustoMSC has released a special report entitled ‘LNG fuelled Mobile offshore units’. 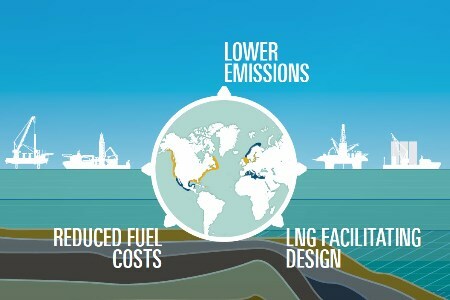 The report describes the use of LNG for mobile offshore units, and considers the most relevant technical, operational and economic factors for the use of this fuel in such units. The maritime industry is experiencing increasingly stricter global and local emission limits, mainly due to a continuing rise in environmental awareness and subsequent political initiatives. Mobile Offshore Units, such as construction vessels, drillships, jack-ups and semi-submersibles, often operate in so-called ECAs (Emission Control Areas). Meeting the associated limits for Sulphur Oxides (SOx), Nitrous Oxides (NOx) and, Particulate Matter (PM) emissions is therefore an important consideration for units currently in operation, as well as new builds. GustoMSC has been monitoring the development of LNG (Liquefied Natural Gas) as a marine fuel for several years, culminating in a recently finished R&D project into LNG for its design portfolio. The associated report concludes that feasible LNG applications are possible when all technical, operational and economic aspects are considered at an early stage. Different possibilities exist to optimize designs, business cases and supply chains. All of these require careful alignment with the unit’s design and operations. “As designers, we try to take a holistic approach to these things and consider everything from technical to finance to vendors, and we think that’s a real added value”, says Douwe de Jong Project Manager R&D GustoMSC and author of the report. “What we’ve tried to do with these concepts is to show a very big design space of options and discussion topics”, de Jong concludes. Of the units considered, the Dynamically Positioned vessels and semi-submersible showed the highest potential for fuel cost savings. Offshore wind installation was identified as a promising market for implementation of LNG as a fuel, due to its predictable operational profile and associated shore bases. When implemented correctly, the result can be significant savings in fuel costs and emissions over a unit’s lifetime, as well as futureproofing with regard to new ECAs, emission quota and increased global uptake of natural gas.